Cheltenham South and Leckhampton was the last station on the Great Western Banbury and Cheltenham Direct Railway before it joined the main Birmingham to Bristol line just south of Cheltenham. The line was built in the late 19th century and doubled in 1908. It is this latter condition that we have attempted to model. It was a compact site and although not modelled to full size there has been only a small amount of compression to keep it to a managable size. 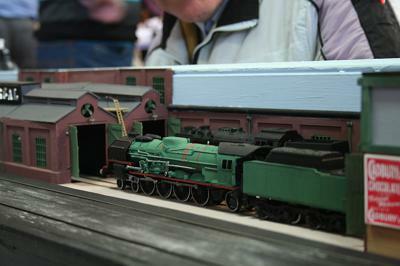 The layout is finescale "00" and the buildings are scratch built from the few plans available and photographs from various sources. While it may not be totally accurate, we have been assured by those that knew the location that we have captured the essence of the site. It is normally operated with GWR stock representing the mid 1930s, although little changed over the years until closure in 1962 so it would be possible to run BR stock. We do not operate to a timetable as there was only something like five trains per day and that would be rather boring for us all. Little remains today other than the bridges at each end, the site being given over to flats and industrial units. 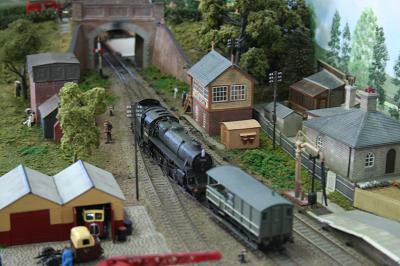 The layout was inspired by a visit to Cromer in 2005 when I spent a few days travelling on the railways in that area. I based it on photos and measurements taken during a further visit in August 2008. 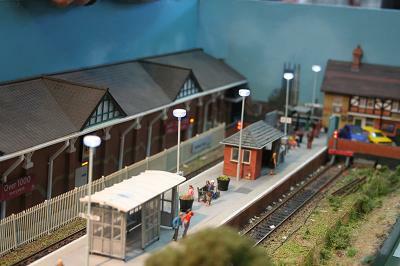 All of the main features have been included with a Morrisons supermarket, part of the original station building which is now a pub and a very stylistic house opposite the signal box; the restored signal box is also modelled. 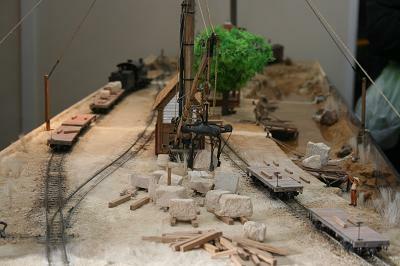 The platform length and width have been reduced a little and whilst the cutting length is about accurate as far as the crossovers, it is very much foreshortened to the bridge in order to keep the layout to a reasonable length. The track is Peco 100 with medium radius points (space constraints did not permit large radius) and the plain track has the sleeper spacing increased to improve appearance. There are working colour light signals with theatre indicators and the SPAD lights further up the line also operate but not yet automatically. 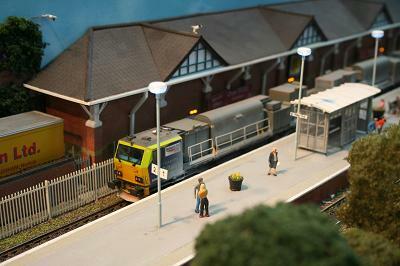 DCC control is used and the rolling stock which is mainly DMUs have lights and sound from Bachmann and Hornby. There may be the odd steam special from Sheringham now that its level crossing has been reinstated. A small north-eastern branch line station, Fryupdale actually exists in North Yorkshire, although it never had a railway. The track plan is of nowhere in particular but the structures and buildings are based on prototypes. 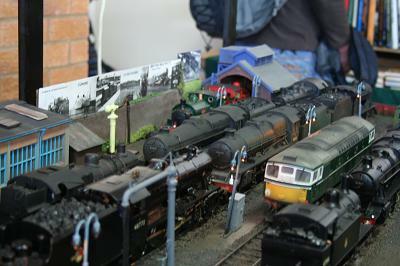 More details of these are given in photographs on display on the layout. 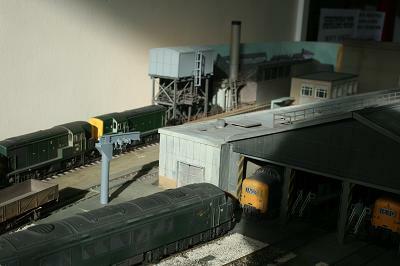 This layout is based on North London circa 1970, and features a section of main line with adjacent locomotive depot. With the total scenic section measuring 24ft long by 3ft deep, Homsey Broadway fits into the same footprint as previously built layouts, forming a continuous circuit when matched with its end curves and stock storage yard. A small section of this project is presented here today, showing the differing levels and a flyover which typify the route out of Kings Cross, giving the slower trains a chance to cross the main lines without interruption. Construction of the open-frame baseboards is entirely plywood for strength and lightness, with EM gauge C&L track and copper-clad pointwork. Llangenydd is a small fictitious village on the Lleyn Peninsula in N.Wales. It is now the terminus of a truncated ex-GWR branch line which ran to the coast. 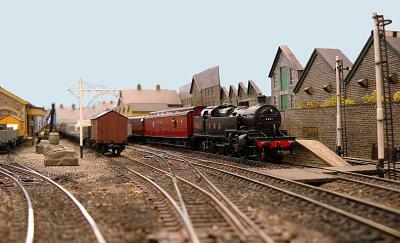 There is an ex-LMS branch joining nearby and trains from Caernarfon are also seen. A new BR road transport depot has been established to forward the goods on. The main traffic consists of materials for a hydro­electric power station under construction inside a nearby mountain and supplies and personnel for the nearby joint-services training camp. Local rail traffic is still heavy as the roads in the area are still not too good. The station enjoys an Indian summer in the late 1950s/early 1960s before the final closure in the Beeching cuts. Locos and stock are detailed and weathered proprietary items with some kit built, and DCC operated. 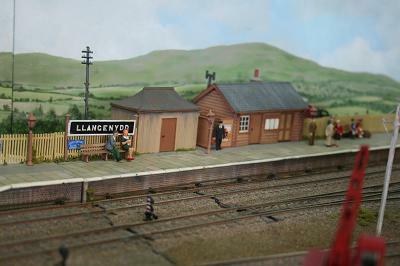 Llangenydd appeared in the July 2010 Hornby magazine. 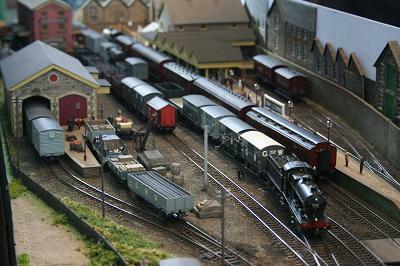 A minimum space 7mm/ft 0 Gauge layout occupying a 10ft x 2ft space upon which the main scenery is the fleet of locomotives. My collection of locomotives was once described as a 'motley' one, so it seemed the natural thing to do, when constructing a layout upon which to display them, to call it 'Motley'! We assume that the seaside town of Motley has year-round local passenger traffic and freight trains to and from the harbour. There is a reasonable harbour and a private freight railway served by a fleet of small industria1 locomotives. During the summer months there are special trains from all over the country bringing holidaymakers and day trippers. All these engines need somewhere to rest until the time of their return working. The sub-shed seen here at Motley provides that space. 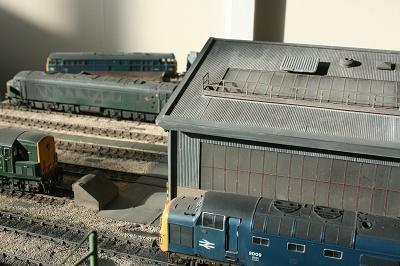 This is not a large motive power depot, just somewhere to park locomotives between duties and perhaps replenish the tenders or clean clinker from the firebars. Beside the BR sidings are those for the industrial locomotives which can be seen beside their larger counterparts. 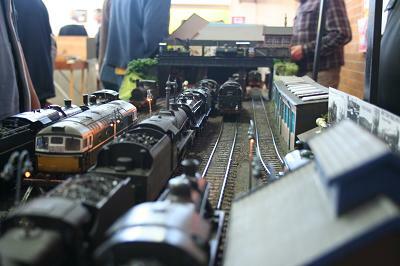 So much for the fiction; the locomotives themselves occupy most of the space on this small layout. Upwards of a dozen engines can be seen 'on shed' at any given time and they will be seen going on and off shed, and being repositioned to allow others to move. Most of the locomotives and other scenic items have been hand built from kits, and I am grateful to Keith Blake, Aiden Houlders and Peter Whyborn for building these for me, and to Andy Wilkie who assists with the operation of the layout. 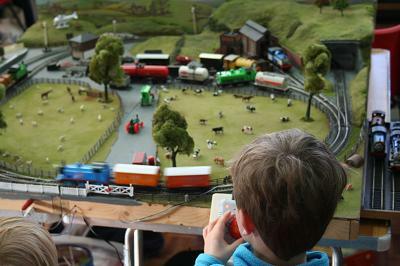 It is possible to operate this layout with locomotives from BR (5cR), BR (LMR), BR (WR with SR interlopers!) or a mixture of all of these. Penrhos is a fictitious rural community set somewhere in a relatively remote part of rural Wales served by a BR (WR) branch line. It location has deliberately been kept vague so that motive power and rolling stock that would have been seen right across the former GWR system in this area in the 1950s to 1960s can be run. The layout was built to capture time and place. This has meant getting the 'right' locos and rolling stock for the area and period. In addition, the appearance of the natural landscape and the human imprint upon it has received a lot of attention. 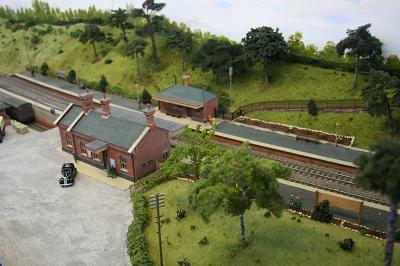 The aim has been to make the railway look as if it has been engineered through undulating terrain. By not treating scenery as an afterthought, the railway has been integrated with the natural and built environment. Empties are brought in, and propelled under the loader. 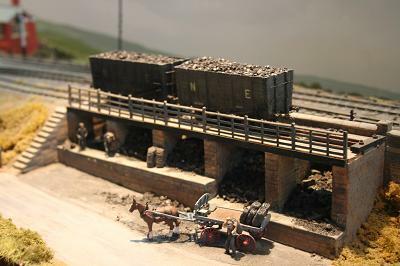 Removable stone loads are placed into the wagons, which are then drawn forward to the entrance to the quarry sidings ready for removal. Some short branch freights run straight through Penrhos, others stop to set down and pick up loco coal, oil, and general merchandise. 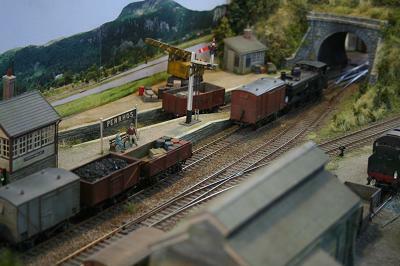 Rakes of empty and loaded ballast and spoil wagons are occasionally supplemented by elderly vans and 4-wheel coaches transferred to the engineers' fleet. These services are provided by diesel railcars or DMUs, steam hauled push-pull units, and occasionally loco-hauled coaches plus a van. Some run straight through - with or without brake vans; others leave or return to the loco shed at the beginning or end of their rostered duties. Smallcombe is a busy terminus at the end of a single line branch located 'somewhere' on the Western/Central division of the LMS, set in the mid 1930's. The area presumed to have a significant demand for frequent passenger services and a considerable requirement for all kinds of goods traffic. Smallcombe is the terminus of the branch line, and is reached via the country town of Bishopsmead. 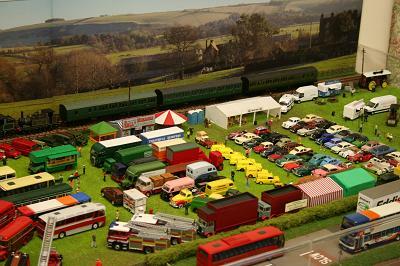 The layout portrays Smallcombe station and its industry, comprising dairy/creamery, warehouse, and gasworks, in addition to the normal goods facilities, together with a short length of the line from the tunnel. 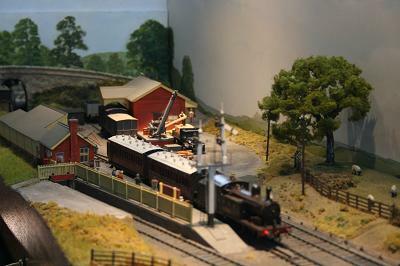 The 'Fiddle Yard' represents the branch line and the connection to the LMS network. Notwithstanding the fictitious location, an operating sequence has been developed and is run which although intense, is both plausible and (we hope!) more or less correct. 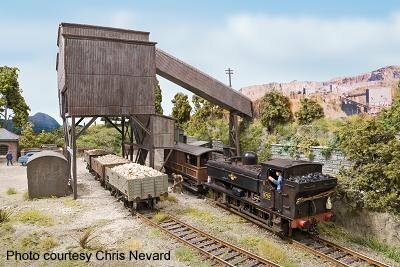 The rolling stock on the layout is a mixture of predominantly kit, modified kit or scratch built items together with a few extensively modified proprietary items. The stock is generally in both the early and later pre-war livery styles. 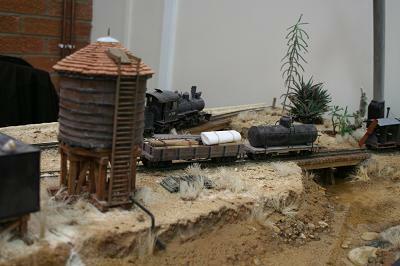 Buildings are mostly scratch built but include kit/modified kit where these are appropriate, and the scenery uses all the usual Woodland Scenics materials and the like. Somewhere in the south west of Texas soon after the turn of the 20th century, the railway exists to haul block stone from the distant quarry to the railhead for trans-shipment onto barges for passage downstream when the creek is running. This isn't very often and the loading derrick is a bit temperamental needing nerves of steel and a manual dexterity lacking in most to operate - activity is therefore erratic at best. The railway has very limited resources and even less business and it shows in the general decrepitude of the operation.